Just a short walk away from the wonderful downtown square in the center of Sonoma you’ll find the historic Sebastiani Vineyards and Winery. The winery is over a 100-years-old and they’ve used that time to perfect their fabulous wine. 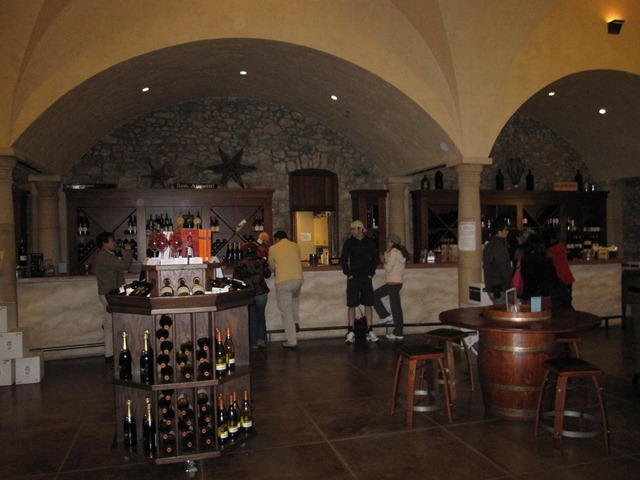 Inside their beautiful tasting room is a long wooden bar flanked at one end by an enormous fireplace which was blazing on the cool winter day when we visited. 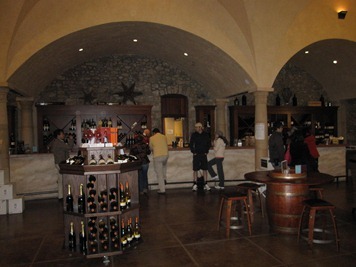 The lady who served us was friendly and very knowledgeable about the wine and the Sonoma area. Tastings are $10 for 7 wines and the fee is waived for wine club members. It’s not waived if you buy a bottle (unlike many other wineries in Sonoma County). Our Visa Prestige card didn’t get us this tasting for free (also unlike many other wineries in wine country) but it did get us a 10% discount on wine you purchase – which worked out well since we left with both a bottle of the 2007 Russian River Pinot Noir and the Sonoma County 2006 Cabernet Sauvignon. We found the Pinot Noir to have rich black cherry flavors (just as promised) and to be a complex red wine that didn’t really remind us of very many other Pinot Noirs! In general we go more for Cabernet Sauvignon and Zinfandel, but this Pinot Noir really impressed us! The 2006 Sonoma County Cabernet Sauvignon was good but not excellent. We bought it because it seemed easier to drink and more “middle of the road” than some of our favorites. We tend to get really excited about really big, bold, dry Cabernet that might not go over so well at a dinner party (more for us!) This should be very well received by most everyone. We also (unexpectedly) loved the 2008 Un-Oaked Russian River Chardonnay. We’re not big white wine drinkers. (Red wine goes better with chocolate 😉 ), but this white wine had us wanting more! We found it very fresh and clean tasting. 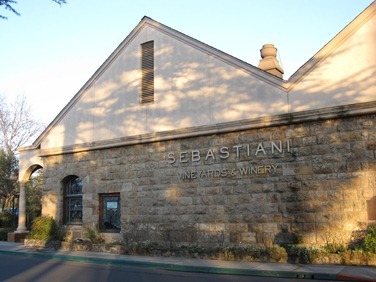 Sebastiani Winery is open from 10-5 daily and offer complimentary tours of the winery at 11:00AM, 1PM and 3PM.